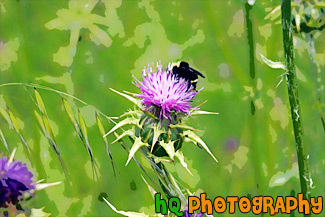 A close up picture taken of a bee landing on a Winged Thistle wildflower located in the hills of Palo Alto, California. These Winged Thistle wildflowers are common towards the beach in Northern California. Other common names for this flower could include : Winged Plumeless Thistle, and Italian Thistle.